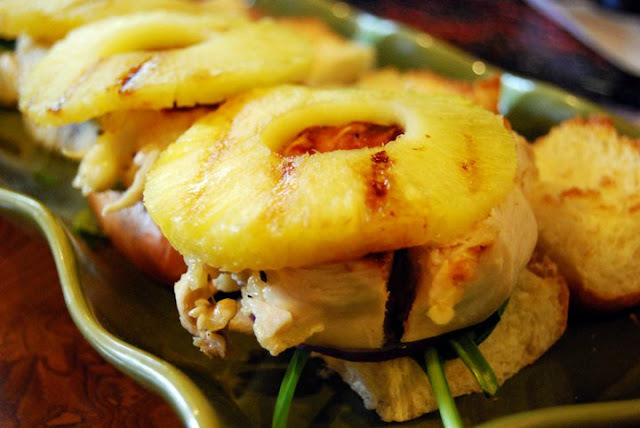 I adapted my Pineapple Chicken Sandwich recipe from allrecipes.com Pineapple Chicken Sliders. The first time I made this recipe, I made it as stated and it was just okay. The sandwiches were a little dry from using boneless, skinless chicken breasts, and I wasn't crazy about using straight teriyaki sauce on the roll. I made some changes and now we all love this sandwich. Heat a frying pan over mid-high heat for a few minutes. Put the chicken breasts breast side down in the dry pan. It will sizzle. Don't move it! Let it sit to caramelize. After about 3 minutes, flip the chicken over and put the pan in the pre-heated oven to finish cooking. If your skillet is not oven safe, be sure to transfer the chicken to an oven safe dish. Bake for about 25-30 minutes. Chicken will be done when it reaches 160 degrees F internally, so check it with an instant read thermometer after about 25 minutes. When done, remove chicken from oven and let rest for 10 minutes. Cut breast meat off the bone and then cut each breast in half. While chicken is resting, add teriyaki sauce to pan. Cook on medium heat and stir to remove all the yummy bits from the pan. Continue stirring until the liquid has reduced a little. Add pineapple to the pan and cook a couple minutes each side until heated through. Spread some sauce from pan on the bottom half of a toasted roll. Add lettuce, a piece of chicken, a pineapple round, and an onion slice. Put the top on it and repeat to make rest of sandwiches. Serve and enjoy! Note: Using bone-in, skin-on chicken breasts will result in much more flavor and moistness. And, bonus, they are always cheaper than buying the boneless skinless breasts.